For mod equations, when can you NOT square both sides and what do you do then. When you have to find out a in Rsin(x-a), do you use Sinx/Cosx or Cosx/Sinx ? 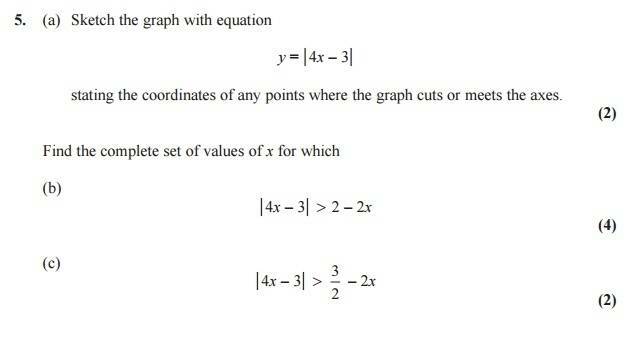 Sorry if this is confusing, but any help would be really appreciated. If anyone could just talk me through part b, to determine on which side you would put the minus, the question being from the June 2014 (R) paper that would also be much appreciated. Thanks and you wouldnt put >/ (equals to ) or /< (equals to ) on this because if it were when equals or bigger/smaller than 0, then you would do that?. Also originally I meant what happens if you have two mods on either side of the equation, would the squaring method still be viable. Ah, so you've got values like 10, 12 in the second quadrant? If so, it's possible that they specified a domain, or that they're not interested in the bits to the left of the y axis but you probably wouldn't lose marks unless they specified the domain. I think it is possible, if it was +alpha and you had it in the form -alpha then alpha would be a negative value. Ah ok thanks! do you mind helping me with https://07a69ccf283966549a9350d1a669...%20Edexcel.pdf 3c? For 4b how do we know which value to use once we have done it with both a positive mod and negative mod? Does anyone have a list of formulas we need to know off the top of our head? Whoops sorry everyone, think I scared everyone with that question on mod inequalities! Think about cos and the values it takes between 0 and 2pi, and try to spot the values that only come up once, and then see how you can apply that to find the correct answer. If you're asking about fg(1), then mod(-1) = 1. Just do the exam really slowly and check your answer after very question and then check everything again at the end. Just do that in a few past papers today and see if you come out any better?